One of my favorite things to eat is beets – which is a huge surprise to my adult self! Growing up we had something my Mom called “Harvard Beets”, which were a sweet and sour affair in a gluey sauce. I hated them and would do anything to get out of eating them. Fast forward a few decades and I can’t get enough, especially of the roasted variety. Even my niece, Sarah, who said she hated beets liked these when I made them on one of her recent visits. Beets are plentiful right now and will be right up until fall. This time of year they have especially beautiful and tender greens attached which are delicious. The beets and greens can be prepared simply as in these recipes or you can use the beets in salads. Preheat the oven to 425 degrees F and place the rack in the upper third of the oven. Remove the beet greens and set aside if you will be cooking them also. Cut the stems off the top and the root off the bottom of each beet and then peel with a knife or a vegetable peeler. Cut into pieces. If the beets are small, you will want to quarter them; if larger, cut into 1-inch chunks. Place in a bowl. Process the garlic through a garlic press into the bowl of beets. Add just enough olive oil to lightly coat the beets and then toss to thoroughly blend beets, garlic and oil. Line a cookie sheet or bottom of a broiler pan with foil. Turn the beets onto the prepared pan, put in the oven uncovered and roast for 25-35 minutes until they can be pierced with a fork. Check and stir after 15 minutes. 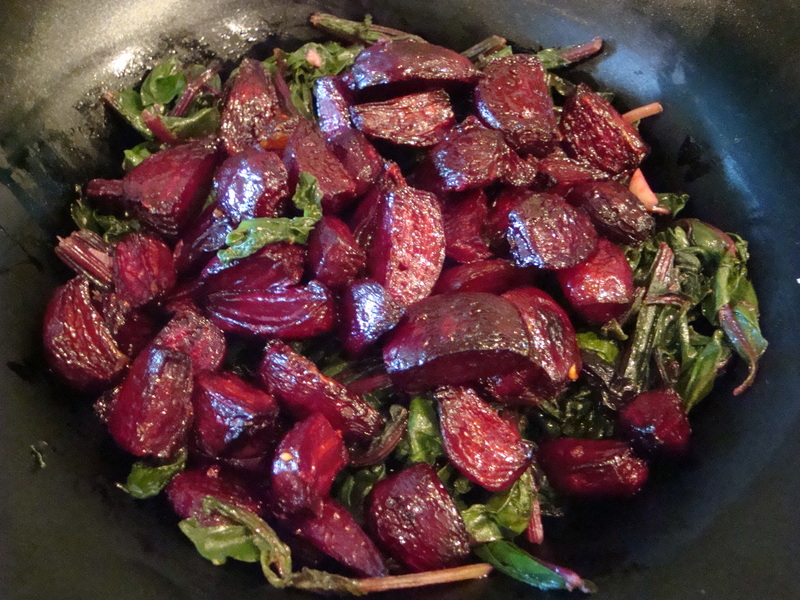 If cooking the beet greens, serve the beets on top of the greens. Otherwise turn into a serving dish. Run a sink full of water and immerse the greens, then drain. Do this a couple of times to remove all dirt and grit. Cut off the stems and then slice or tear the larger leaves into smaller pieces. Place the greens in a collander. Put enough olive oil to lightly coat the bottom into a large dutch oven. Heat to medium. Place 2-3 cloves garlic, sliced thinly, into the oil and cook for 2-3 minutes, stirring. Turn the heat up to medium high and add the greens a batch at a time. Stir constantly until the greens are wilted and tender. Place in a serving bowl and serve with the roasted beets atop the greens or with baked feta and olives.